Eight women of Thekkekara village in Kerala’s Alleppey district meet twice a week. The get-together is for making coconut oil that can heal rashes and cure skin diseases, and chutney powder. But do not confuse this coconut oil with the ones available in the market. Unlike the branded oil that is prepared from dried copra, the Thekkekara women use fresh flesh of coconut. For years, each family in the village has been making oil for its own consumption using the traditional method. But with changing times, many have started buying mill-pressed oil. To restore the traditional oil and popularise use of coconuts, in 2007 the Central Plantation Crops Research Institute (CPCRI) in Kayamkulam, Kerala, started training people to make oil using fresh coconut flesh. The efforts yielded results as 30 self-help groups (SHGs) in Alleppey are now producing the medicinal oil. The eight Thekkekara women also learnt from CPCRI and formed an SHG, Sauhrida, meaning “friendship” in Malayalam. They congregate at 49-year-old Prasanna’s house and grate 40 to 50 coconuts in a day. They then add warm water to the grated flesh and squeeze the mixture with hands. The pulp is separated from the milk. This milk is boiled while being constantly stirred. Impurities (proteins) coagulate and the oil separates. The protein and the remaining pulp are mixed to make the chutney powder. The mixture is dried over fire in a brass alloy pan. Ginger, pepper, salt, asafoetida, curry leaves and black gram are added to it. The dried mixture is then pounded to form a powder. The two processes take not more than two hours. The oil business does not burn a hole in the pocket. The biggest investment for Sauhrida was the brass alloy pan that cost Rs 16,000. The oil bottles and chutney packets have labels on them. Each label costs Sauhrida one rupee. Prasanna maintains the business records for Sauhrida. She showed that on November 14, 2011, the members used 42 coconuts. 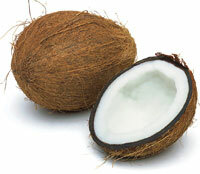 At Rs 11 each, the total cost for coconut was Rs 462. Ginger, pepper and other condiments for the chutney powder cost Rs 125. The output was 1.6 litres of oil and 6.2 kg of powder. The oil was sold at Rs 300 per litre and the powder at Rs 200 per kg. The total collection was Rs 1,720. This left a little more than Rs 1,100 as profit for the members. The value addition for each coconut is around Rs 13, says P Anitha Kumari, senior scientist at CPCRI, who trained Sauhrida members. The group divides the profits into nine parts instead of eight. The ninth part is put in the bank and can be loaned to any member in times of need. At the end of 2011, Sauhrida had Rs 17,000 in its bank account. Of the eight, seven women’s husbands work in the Gulf. The profit comes in handy when they send money late, or want to splurge during festive seasons, or in times of medical emergencies. “The market price for the oil and chutney has doubled since we started,” says Sarala, a team member. They have ready buyers in bakeries and supermarkets. Seeing Sauhrida’s success, women from surrounding villages come to us to learn, says Prasanna. great piece of information. is this oil available for purchase somewhere in Delhi? Local co-ops is truly a wonderful thing! Not only are the materials local, it is healthy, unadulterated and is very personal since it is not run by some conglomerate whose only goal is profit! Thank you for this excellent piece of info! Is this oil commercially available in other parts of India? If someone desires to prepare this oil at home, where can one find the detailed procedure? Making "Urukku Velichenna" is so simple. Malayali grand-mothers know this well. Anyone with some coconuts, a mixie, stove/induction heater and a little patience can make it. The oil is not available in the market as yet. But it can be easily made at home. Here's a detailed version of the recipe - grate fully matured coconut, add half portion (by weight) boiled water and mix. After cooling, press out the oil by hand or by a press. Sieve and heat in a thick vessel while stirring continuously. The oil will separate out from milk and the protein will coagulate. Separate out the oil. The oil can be heated in a water watch to remove moisture. The oil is ready to be stored indisinfected glass bottles. when they grate the coconut do they include that brown thoal or skin with the gratings or should that be avoided? how did they traditionally measure the weight of the water and the weight of the gratings? what is a water watch you say to use to heat the oil in and how to determine all the moisture was successfully removed? how long does this oil store for?